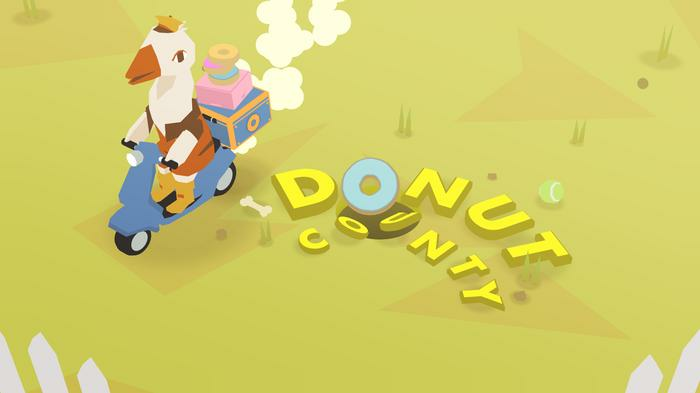 In 2018’s landscape of hectic battle royales, belabored prestige exclusives and infinite sequels, it feels rare to find a game quite as original and immediately-likable as Ben Esposito’s Donut County. Within minutes I was charmed. Though I reached the end of my time with Donut County only a few hours later, I was delighted to have seen the physics puzzler through to the end. The whole experience is as delightful as it sounds and, what's more, it doesn’t overstay its welcome. 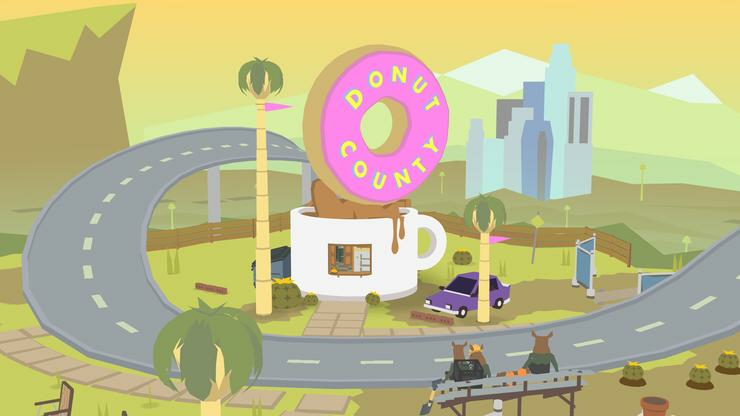 Developed by solo developer Ben Esposito, Donut County is set in in a colorful and anthropomorphic alternative to California. You play as BK, a talking racoon who runs a donut delivery business in the sleepy hamlet of Donut County. Local residents order donuts via an app, and you deliver the goods. The hook here is that you aren’t really delivering donuts. Instead, you’re delivering vacuous, gaping holes in the earth that consume everything in their path. 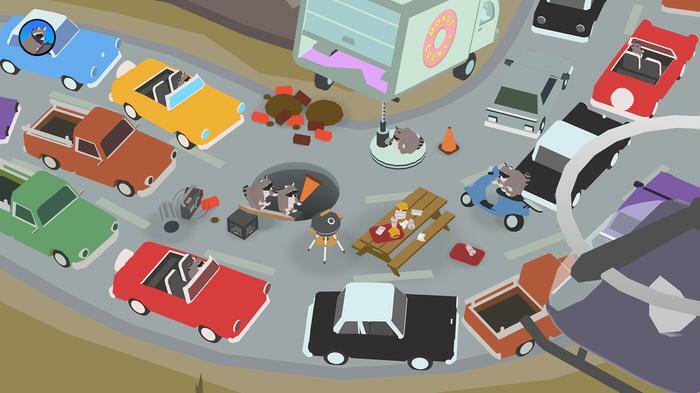 Each level of Donut County sees you control a hole using the mouse. Sucking in stray objects causes the hole to grow in size. Your goal is to eat up everything on the screen. You’ll start with rocks, graduate to boxes, cars, trees, homes and more. Each sequence starts small but by the time you make it to the end, it’s as absurd as it is delightful. If you’ve ever played Katamari Damacy, you’ll be right at home here. Like those games, Donut County is filled with colorful environments, emotive characters and a tasty sort-of vibe. At times, it almost looks like a pop-up book or animated cartoon come to life and the soundtrack is gleeful throughout. The story here whips back and forth between the present - where a mob of angry residents are trapped underground, chastising BK for ruining their town - and the past - where you get to play as BK as he delivers each denizen unto their current subterranean predicament. It’s a fairly on-its-face allegory for things like gentrification and the arrogance of disruptive tech companies, but the whole thing is played for laughs. And most of the time, it gets them. The dialogue exchanges during the game’s cut-scenes are outright-hilarious and there’s rarely a limp gag to be found. If there’s any weakness here, it’s in the repetition. Donut County offers up a baker’s dozen of tasty levels - but most of them feel identical outside of some light theme and layout changes. Later stages of the game do attempt spice things up with a few unique mechanics like liquids, pyrotechnics and a catapult ability. Nevertheless, it just feels like there’s just not enough variety here. Again, I wouldn't say the game outstays its welcome - but it gets close at times. Donut County can also be painfully easy at times. I never really found myself even close to stumped by any of the game’s physics puzzles. If you’re here for the vibe, these shortcomings might not be too much of an issue. But if you’re hoping for something a little deeper, well, the rabbit hole doesn’t go that deep. 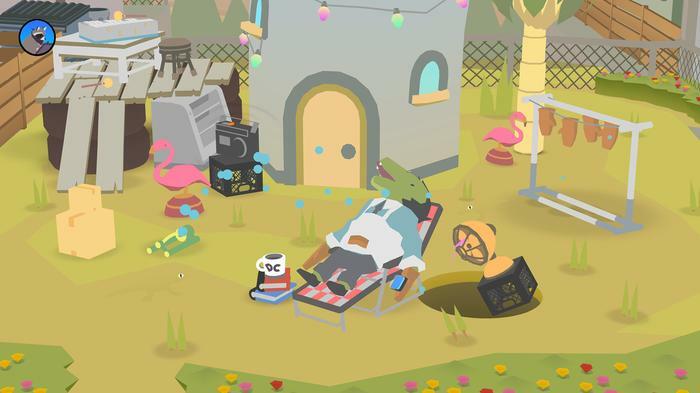 Though the whole thing is said and done in a handful of hours, Donut County is packed to the gills with enough character, comedy and charisma that it’s easy to recommend regardless. 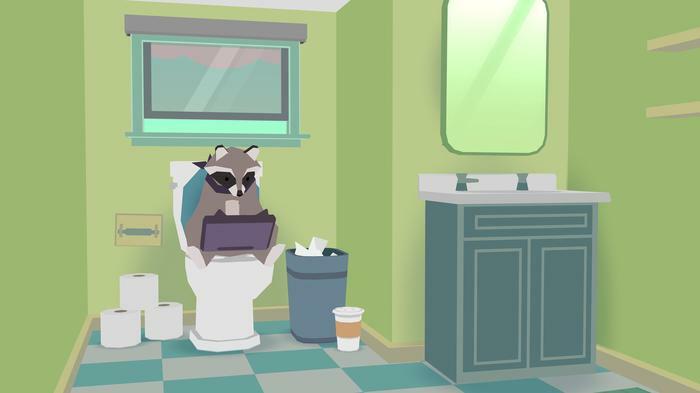 It’s a game where a talking raccoon literally consumes a town via the gig economy. If that’s a premise you’re not excited about sinking your teeth into, I don’t know what to tell you. Like a good glazed pasty, It’s over all too soon but Donut County manages to be funny, fun and full-of-heart. Donut County is available now on PC, Mac, iOS and Playstation 4.